On October 21st, 2016, five proud Crow members, Professor Shelley Staples, doctoral student Hadi Banat, Aleksandra Swatek, Ashley Velázquez, and Zhaozhe Wang, flew with Crow to the wild West and stretched their wings in the lively college town of Tempe, Arizona. 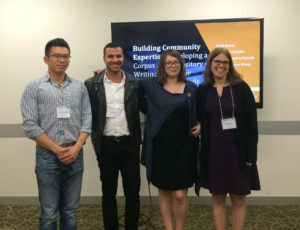 After an entire year’s hard work dedicated to this now fully fledged interdisciplinary project, we were honored to have the opportunity to represent our team and introduce our project to an enthusiastic audience at this year’s Symposium on Second Language Writing (SSLW). 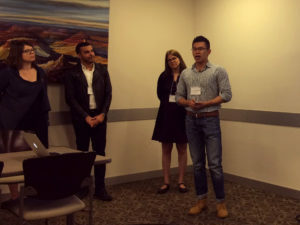 Not so long before that, on September 16th, another group of Crow members, Ge Lan, and Jie Gao along with SLS doctoral student Ji-young Shin, had presented on an empirical study derived from the Crow project—on students’ use of reporting verbs. This talk was part of the annual conference of the American Association of Corpus Linguistics (AACL) in the equally beautiful college town of Ames, Iowa, and successfully attracted yet another audience. These presentations were the best birthday gifts for our one-year-old baby Crow, and anniversary gifts for the intellectual relationship between team members from two disciplinary fields—rhetoric & composition and second language studies. So far, Crow has positioned itself in the intersection among audiences from diverse, even vastly epistemologically and methodologically different disciplines, including rhetoric & composition, corpus linguistics, applied linguistics, technical communication, and second language writing. And the list will continue to grow as we attend more conferences and share our research in journals. All of us Crow members have been highly committed and contributed lots of time and energy to its growth. Yet this growth is not solely marked by how many audiences we have reached out to, but by the professional growth of every individual Crow members as well. We have been able to take as much as, or even more than, what we have given. Since we have recently showcased the progress of our project at two important academic conferences, I think it’s a perfect time to look back as we are taking small but steady leaps forward. And it’s a perfect time to hear from some of the Crow members about their experiences at the two conferences. 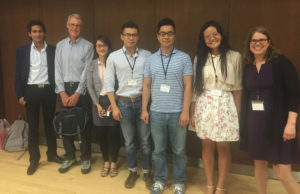 So I invited Hadi Banat, Jie Gao, Ge Lan, Aleksandra Swatek, and Ashley Velásquez, who presented at either or both of the conferences, to share their reflections with us by responding to several questions. Let’s hear what they have to say. Q1: What were your experiences like in general at either/both of the two conferences? Jie: I attended AACL in this September at Iowa State. I was really impressed by the pre-conference workshop held by Dr. Stefan Gries, which introduced of the application of R software in corpus linguistic research. Hadi: My experience at SSLW was crucial in terms of positioning myself in the discourse community of second language writing scholars. I felt it was a great opportunity to interact with professionals in my field and learn about the new trends of research. Ge: For AACL and SSLW, I did see people talking about their research from different angles, which helped me broaden my research perspectives. Both conferences offered various topics to cater for different audiences. Aleksandra: I only attended SSLW, but I felt like I am among academics who have very similar interests to mine. It’s an amazing experience to be able to interact with people who are as interested in second language writing as I am. Such conferences give me motivation to work even more and to contribute to the field. Ashley: As always, I enjoyed SSLW. It’s a wonderful conference in terms of both scholarship and networking and catching up with old and new pals. Q2: What’s your biggest takeaway from either/both of the two conferences? which investigated Worldbuilder as a tool for text-world analysis and visualization. The presentation showed how the tool was used to produce visualization of the annotated data in the form of text-world diagrams based on the criminal case of Amanda Knox. The murder trial lasting from 2007 to 2015 has aroused attention world-wide, and Worldbuilder helped prove the translation of Amanda’s three statements as inauthentic to the original ones. Interestingly, Netflix presented a documentary based on the case just after AACL ended. The presentation at the conferences displays how corpus linguistics can be utilized within forensic issues. Hadi: On a professional level, I felt assured that the field of second language writing is expanding and flourishing. The new strands of presentations that were not in previous conferences reflect the variety of topics and research trends of interest. A dominant focus on graduate second language writers in US institutions was an interesting observation because it reflected the diverse professional opportunities and needs of the job market. I felt that the balance between plenaries, colloquiums, and concurrent sessions contributed to my learning experience due to a mix between talks, workshops and presentations. On a social level, I believe I got closer to my cohort of SLS PhD students at Purdue because we had plenty of opportunities to interact and learn more about each other. Through our conversations, I noticed mutual compassion, respect and admiration, which made me feel psychologically better about my choice of Purdue as home for my PhD studies. I also had a chance to meet SLS Purdue alumni, who are doing very well in their careers in the US, China and Japan. They were accessible, welcoming, cooperative and engaging. I made new connections and friendships that I want to pursue. Ge: For AACL, I realized the importance of programming skills in corpus linguistics and for SSLW, people gave me and Zhaozhe a lot of critical feedback on our project, so we can revise the methods and results. Ashley: My biggest takeaway, honestly, is that we’re emerging in some way. Often, as a graduate student, I tend to forget that the scholars I’ve propped up on a pedestal were once PhD students such as myself; they, too, had no idea what they were doing and had to fake it till they made it. The theme for SSLW this year emphasized expertise; and what I’ve learned about expertise is that while some may revere others as an “expert” we’re all just learning as we go. Q3: Could you say a little bit about your experience presenting on projects related to Crow? What did you present on? Were they well-received by the audience? Did the audience provide any constructive feedback that we as Crow members may draw on? 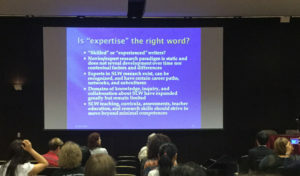 Jie: I co-presented with Ge Lan and Ji-young Shin on the reporting verb projected based on the pedagogical use of PSLW. We clarified why inferential statistics have not been used, and the audience members were interested in the future research potential in data from the control group. Hadi: Our Crow presentation was well-received. Although it was early in the morning, we had a great audience who were listening attentively and taking notes. Paul Kei Matsuda was among the audience, which was intriguing. We did not have time for many questions, but through our brief conversations with the audience there was an interest in an interdisciplinary project that invites collaboration across institutions. One of the interesting questions we received was, “Are you considering expanding the corpus and repository to include writing samples and pedagogical materials from other classes?” Dr. Staples expressed a common interest with Dr. Dilger to include samples and materials related to writing in the disciplines in the future after developing the online interface and finishing the current phase of the project. Ge: For AACL, I have co-presented with Wendy and Ji-young on the reporting verb project. People encouraged us to do statistical analysis to further strengthen our results. For SSLW, I had a co-presentation with Zhaozhe, and people gave us a lot of constructive feedback on how we can revise the method and how we can interpret our results more clearly. Ashley: At SSLW I presented with Scott, Ji-young, and Shelley on our reporting verb project. It seemed that our project was well received by the audience. One thing I do remember was our slip up of using “significant” as a descriptor. Q4: How, and to what extent, has your engagement with Crow shaped your professional development trajectory in terms of professional conferences? Jie: Crow inspired me to chew more on how to carry out quantitative analysis in second language studies. I have also been spurred to think more about the relationship between teaching and research, or how to keep a balance between the two. Hadi: Being part of Crow team offered me valuable opportunities to present at flagship conferences with my colleagues. My involvement in Crow is a learning experience because it is adding to my knowledge which facilitates having scholarly conversations with people in different disciplines pursuing different research projects. Ge: When preparing the conference Powerpoint, I learned a lot from my co-presenters not only from their academic knowledge but also from their carefulness and patience. Ashley: Honestly, it’s been the connections I’ve made and the knowledge I’ve gained from the mentorship that Crow offers us. I’m more confident in my identity as a researcher and emerging scholar since being involved with Crow. As our team members have nicely reflected, they all feel grateful for the great professional development opportunities Crow has provided, and they all feel proud to be part of this initiative. Despite the fact that they have varying research interests, methodological orientations, and levels of engagement, they have all gained something that’s personally fulfilling from Crow. That’s the beauty of it. And that’s what’s going to drive us to fly higher and farther.